Despite all my rage, I am still...oh wait, sorry, wrong bit. Image courtesy of Ford Performance. I’m liking The Grand Tour’s second season. Female tame racing driver, great locales, and some truly fun times (especially the latest episode, which has an amazing Lancia 037 vs. Audi Quattro segment). It’s also a great source of mystery, and I’m not just talking about how weird it is that they haven’t mentioned Abbie Eaton‘s name on-screen yet. In this season’s second episode, Jeremy Clarkson raced against Richard Hammond and James May in the state of New York. Richard and James used public transportation—bus, airplane, subway—while Jeremy was in the always astonishing Ford GT. Their finish line was the American side of the Niagara Falls; on the way, Jeremy had to pay a toll. He had an electronic toll pass, but when he pulled up to the reader, it suddenly became illiterate. The approach was excellent; follow-through, meh. Image courtesy of Amazon/The Grand Tour. Admittedly, it was another way to raise the tension and drama of the race. And I’m sure other people have experienced this issue on road trips or commutes in the past. But something about this seemed odd to me. As much as we joke, I think this wasn’t in the script. Image courtesy of Amazon/The Grand Tour. Jeremy fumbled with that toll pass longer than I had expected. And he also seemed genuinely confused as to why it wasn’t working. He did get it to work eventually, but only after several long moments pressing it up to the windshield. After I re-watched the episode, I had a crazy thought. The Ford GT’s passenger cell is made of carbon fiber. And it seemed to block the signal from an electronic toll pass. Could the GT be acting like a Faraday cage? Quick background: a Faraday cage, named after one of the most influential chemists in history and a not-as influential electric car company, is essentially a shield against electromagnetic radiation. These mesh cages are made from woven conductive material, and protect sensitive instruments from background noise. Think EM waves, like morning radio shows, or a building’s WiFi. Since electromagnetic waves are (shockingly!) both electric and magnetic, their passage acts on electrons. Faraday cages work because their material cancels out the charge distribution caused by the waves’ passage: the conductor’s electrons shift to the more ‘positive’ side of the EM field, leaving a net positive cage charge on the other end, which cancels out the ‘negative’ part of the field. GIF of how a Faraday cage (or rather, shield, here) cancels out external EM signals. Image courtesy of Wikipedia. However, this shielding isn’t necessarily perfect. High frequency (high energy) waves can still pass through a mesh cage, but they’re blocked by the obdurate wall that is a Faraday shield (solid cage). Now you know why the good cables cost so damn much. Image courtesy of Wikipedia. Ever ridden in an elevator and found you couldn’t stream video or make a call? Congrats! You’ve just experienced a Faraday cage, courtesy of the metal used in the box and shaft’s construction. Coaxial and USB cables have a copper mesh between the outside covering and the inner wire for similar reasons: stopping outside interference and preventing inner signal leak. In fact, depending on your paranoia, you may have a Faraday cage in your pocket right now. Know those RFID-blocking wallets you see conspiracy theorists toting? Yup, Faraday cages, intended to stop criminals skimming info from your RFID chip-equipped credit cards. Never mind that RFID chip crime is virtually non-existent, and that you can replicate the shielding effect at a fraction of the cost with a few sheets of aluminum foil. 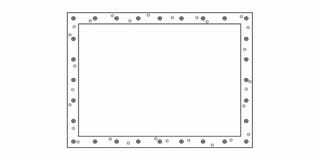 But while Faraday cages are usually made of metal, there’s been another material making some waves (no pun intended) as a signal blocker. What’s surprising is that, at first glance, you wouldn’t think of it as conductive. That material, is carbon fiber. Look, I like carbon fiber. Some of the best cars and bicycles are made from it. But there are way too many ‘carbon fiber’ accessories on sale today. Sunglasses I can kind of understand; you don’t need a carbon fiber shoehorn. Nor, in fact, do you need a carbon fiber phone case. You’ll look like a tool if you have one, especially after putting it on you find your phone doesn’t work. Turns out, there are quite a few stories circling the Internet about people buying carbon fiber phone cases and finding their smartphones can no longer get a WiFi signal, or any other signal. It’s also a subject of discussion amongst the drone piloting community. Drones already have the capacity for creepy annoyance; imagine the chaos if they started crashing from the sky. At this point, you’re probably thinking, “Hang on, carbon fiber doesn’t conduct electricity!” I did, too. After a few seconds, my brain wave was looking like more of a brain fart. There’s a reason computer cables aren’t woven by Lamborghini, after all. So I thought I’d take another look at the situation in The Grand Tour’s race. The Faraday cage hypothesis couldn’t be viable, right? I focused first on the electronic toll pass itself. The E-ZPass Jeremy used is similar to the IPass system my family’s been using for years: a battery-operated radio transponder. 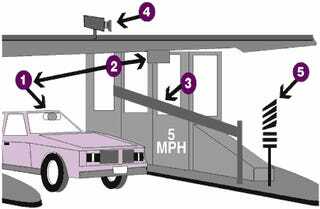 When a car equipped with the pass rolls up to the tollbooth, the pass receives a signal from an antenna mounted to the booth’s roof. This activates the transponder, which draws power from the battery to send a reply. The booth receives this stream of data, checks with a computerized database, deducts the toll charge from the account linked to the pass, and lets the car go through. OK, so maybe Jeremy’s pass was just low on battery? Stand’s to reason, low juice = weak signal. My dad’s IPass had a similar problem at one point, before he replaced it. Except these batteries can last up to 10 years, and I find it highly unlikely Jeremy had been given a pass with a worn-out battery. Plus, if the battery really was on its last legs, there would’ve been no ‘go ahead’ light from the booth at all. No luck here. I then though that maybe the Ford GT was too low for the booth antenna’s activation signal to reach. The detection ‘cone’ of the booth antennas is typically about 10 feet long (though it’s also 6-10 feet wide). The GT’s official height is 43.7 inches, and max speed mode squats it two inches lower. The only road cars of similar height that sprung immediately to mind were Japan’s kei cars, like the Autozam AZ-1. The AZ-1 may bring a smile to my face, but there was no joy for my second hypothesis. See, Japan also has an electronic toll system, only it’s even more rigorous than the ones in the States. The pass can literally be installed in the car, and nothing I could find on the extremely helpful tourist website indicated that kei cars were somehow excluded from using it. I also re-read Ken Saito’s review of the Honda S660, browsed a few forums, and tweeted to Jalopnik’s Andrew Collins to see if the AZ-1 he drove had caused headaches for its owner at toll booths. Nothing unusual to report from any of these sources. Height comparisons FTW. Image courtesy of Amazon/The Grand Tour. Furthermore, I took a look at the distance of the antennas from the GT’s roof. Assuming the GT was in maximum attack mode, dropping two inches than its max height, the antennas would be roughly 153 inches from the road surface, or just over nine feet from the GT’s roof. It might be a strain, but the antennas would still be able to pick that up. Incredibly, every alternative explanation I could reasonably think of was dismissed. And as I dug deeper, my seemingly crackpot Faraday cage idea started to make more and more sense. Firstly, pure carbon in the form of graphite is extremely conductive. Carbon fiber isn’t graphite, but it’s in the same family tree. Also in that family tree are carbon nanotubes, which are rapidly becoming The Next Big Thing in energy storage (and many other applications). Secondly, while carbon fiber composites aren’t efficient conductors, they also aren’t insulators. We can determine this by looking at their conductivity, measured in S/m (Siemens per meter): Metals have a conductivity of approximately 10^8 S/m, while insulators’ is around 10^-16 S/m. A paper presented by Schmidt et al. from St. Louis’ Washington University at the 2013 COMSOL (a physics analysis software) Conference in Boston indicates that, while carbon fiber composites are fairly poor conductors, with a conductivity of approximately 0.03 S/m, they are still conductors. In addition, if I understand the study’s conclusion, it appears that the resistance of the fibers in question depends on the amount of contacts the fibers have with each other. As carbon fiber weaving develops more and more, this would seem to imply the material would become an increasingly more efficient conductor. In fact, there’s a lot of research into increasing carbon fiber composites’ ability to conduct electricity. In theory, this could mean part of the power used by the electric motors of a performance hybrid such as, I dunno, the McLaren P1, could be stored in the P1's own body. Like that Camaro Krypton concept with the electroluminescent paint, but about 1000 times cooler. Also, know how carbon fiber is being used in a lot of plane construction? There’s research into making sure these new designs can conduct lightning strikes. I think Adam Savage would wet himself if he ever visited that particular test facility. This is backed up by a study by Salas et al. in the March 2016 issue of Mechatronics to monitor the health of carbon-fiber reinforced plastic (CFRP) structures. The abstract literally states, “CFRP behaves as an electrical conductor, shielding radio waves”! The University of Illinois at Champaign-Urbana’s Physics Department backs me up on this, too. As does the University of California, which has a team working on using composites to block radio frequencies. I think I’ve beaten this carbon fiber beauty enough. Carbon fiber composites are actually conductive, and can block radio signals. Which means that the Ford GT’s carbon fiber passenger cage is also a Faraday cage. Huh. I think I may’ve finally had a Jason Torchinsky-esque idea. Excuse me, I need to go find a tinfoil hat.